The year is coming to its end and so is the Swedish Presidency. It has been a fantastic year with so much fun, hard work and a lot of results. It has really been a privilege to be able to move the European agenda forward for six months. Apart for some rest over Christmas, this week has been dominated by the entering into force of the service directive and the demonstrations and arrests in Iran. The service directive is good for Europe, it will facilitate for service providers, create new jobs and improve for consumers. The turmoil in Iran is deeply worrying even if we know very little of what is actually happening. Rumours talk about arrests and killings of dissidents, something totally unacceptable. If I could wish one thing for 2010, it would be for democracy and respect for human rights to come also to Iran. In only a few hours, Spain will take over the Presidency of the European Union. I am sure we are in safe hands with them and wish them all the best. With this, this blog will close. I thank all readers and wish you a Happy New Year! It is no secret that we would have wished for a better deal in Copenhagen. The deal the world finally could agree on will not solve the climate issue. There was a lack of political will from some parts and with the current structure of the climate convention, where consenus is needed to come to a decision, the possibilities to delay the discussions are noticeable. Together with several African countries and small island states, the EU pushed for a more ambitious outcome, but those with the lowest ambitions set the agenda. Among the positive results from Copenhagen is the recognition of the two degree target. The commitment to pay for adaptation and mitigation in the developing countries is also important. The commitment from the industrialized countries amounts to about 30 billion dollars for the period 2010-2012, of which the EU and Japan will contribute with more than 10 billion dollars each, while the US puts in 3,6 billion dollars. The commitments to emissions reductions, however, remain too weak and no long-term goal is set. Many unclear points remain, for example the fundamental issue how we could come to a new legally binding agreement for those not included in the Kyoto protocol. It is also disturbing that the deal does not clearly state that we now strive for a global, legally binding agreement during 2010. A lot of work remains to be done if we are to build on this deal and reach an agreement that would put the two degree target within reach. This afternoon, Serbian President Boris Tadic will visit Stockholm to hand over the country’s application for membership in the European Union. This makes it an important day, and actually a milestone in history for both Serbia and the EU. Just fifteen years ago, the Balkans were struck by a devastating war, in which Serbia was deeply involved. Following the arrest of Slobodan Milosevic in 2000, Serbia has moved closer and closer to Europe, which is indeed very positive. In October, the Commission pointed at the positive development of Serbia’s reforms, and this also goes for its cooperation with the Hague Tribunal. There is a clear goal: all ex-Yugoslav countries will be welcomed as EU members the day they fulfil the criteria. There is a complete consensus about this among Member States. We have already achieved a lot: Slovenia is a member since five years, Croatia is likely to complete negotiations during 2010 and negotiations may soon start with the former Yugoslav Republic of Macedonia. Montenegro has applied for membership, and Bosnia-Hercegovina and Kosovo work hard to come closer to the Union. Last Saturday, the visa regime was lifted for citizens of Serbia, Montenegro and the former Yugoslav Republic of Macedonia. This has an enormous impact on countries, where the vast majority of young people have never been abroad. With visa liberalization and today’s Serbian application, we have taken a great and important leap forward towards integrating the entire Balkan in the EU. This means yet another step towards a Europe, where common problems are solved through discussions – and not through war. And this is the whole idea of European integration. One important part of the presidency has been the contacts with the European Parliament and its members. It has mainly been my task as EU-minister, but all ministers ave been in Brussels and Strasbourg to meet with MEPs and participate in debates. Prime Minister has been four times in plenary reporting. All in all ministers have vistited formally, in plenary or committees, 85 times. I have myself participated in 30 debates during the 7 sessions, an also took part in question times and visted three committees. In addition there has been a lot of informal meetings starting with discussions about the election of President Barroso. It has been great fun dealing with the European Parliament and all future presidencies will have to spend much time there as the Lisbon Treaty gives the EP extended powers and co-legislation. I just got back from Strasbourg but I will soon go there again as my hearing as a commissioner-designate will take place in the LIBE-committee in Strasbourg the 19th of January. There is A LOT to study before this so I will have no problems spending time over Christmas. Last session in the European Parliament during this presidency. This time around, it’s two marathon days with a strong focus on foreign policy. Parliament has asked for debates on the Middle East, Congo, Belarus, Georgia, Afghanistan and Pakistan, where I will make statements on how Council is working with these countries and regions. Yesterday afternoon, the new High Representative, Catherine Ashton, was debating in Parliament for the first time in her new capacity. This morning, Prime Minister Reinfeldt has been present in plenary report on the achievements of the Swedish Presidency. Much of the debate dealt with the ongoing climate negotiations, but many Members also wished to debate how the EU has tackled the financial crisis. This week’s visit to Strasbourg has also offered discussions on transparency issues. 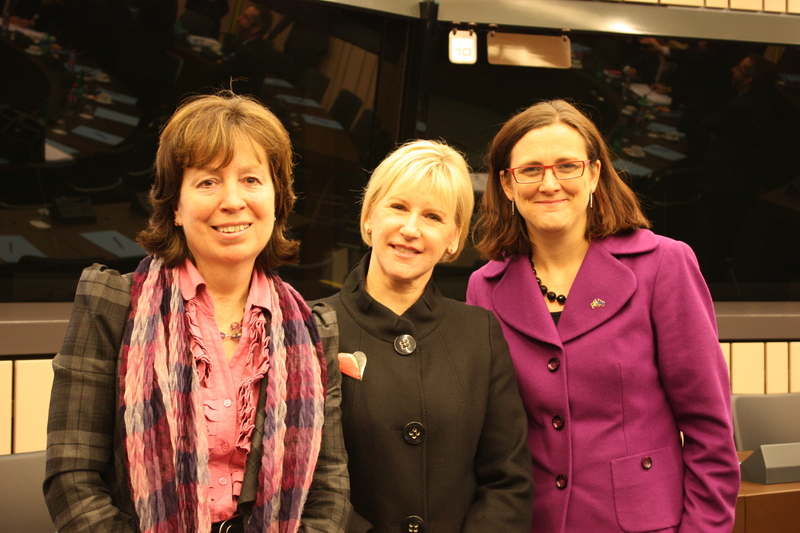 Yesterday, I met Commission VP Margot Wallström and Parliament VP Diana Wallis to discuss how we can make it easier for citizens to access documents held by EU institutions. The rules are in force since a number of years, but if we are to make the Union more transparent and accessible, taking advantage of these rules must also become much easier! One of the most important measures in this respect is to create common search tools and a single website for documents from all institutions. The end of the Swedish Presidency is approaching, and Prime Minister Reinfeldt is attending the European Parliament’s session today to sum up the past months. The outcome of the climate negotiations in Copenhagen is still uncertain, but nevertheless, I feel proud over our achievements these six months. We must not forget that Sweden has led the European Union under very particular circumstances. When we took over in July, Europe went through the deepest economic crisis in 70 years. It was also clear that we had to act decisively in the climate field. It may be a challenge to adapt to a climate-smart economy and lifestyle, but I dare to say that this is the most important issue of our time. The preconditions were somewhat shaky: the newly elected Parliament had barely been formed, the fate of the Lisbon Treaty was uncertain and the Commission was about to leave. Out of our six priorities, we have nevertheless made important and considerable progress in each area, and the Lisbon Treaty, the Stockholm Programme and the Baltic Sea Strategy have been adopted. The ambition of the presidency was that Europe must emerge as a stronger actor after the crisis. New, more effective rules governing the financial markets are about to enter into force, but also new rules about bonuses and bank capital coverage. Thereby, Europe will be better prepared for the future. But we have also set up explicit principles for an exit strategy, to phase out temporary measures and to return to sound public finances. And we have paved the way for a new strategy for growth and jobs, with a view to to strengthening the EU until 2020. We do not yet know what to expect from the conference in Copenhagen, but we know that the EU has arrived at the negotiations with a strong mandate. The EU is to reduce its emissions of greenhouse gases with 20 percent until 2020, and by 30 percent if other industrialised countries agree to make comparable reductions and the developing countries contribute as much as possible. The EU has also agreed on the estimate that 100 billion euro per year will be needed until 2020, and 5-7 billion euro per year 2010-2012 in a so called ”fast start” financing. The EU will be contributing with 2,4 out of the 5-7 billions. It is important that the developing countries are given the opportunity for mitigation and adaptation. The EU has also agreed on a long-term goal for emission reductions: 80-95 percent until 2050. The road to the Lisbon Treaty has been long and winding, but I am pleased that it finally could enter into force by the 1 december. It provides us with modern rules for a more open, effective and democratic union. The Treaty also led to the appointment of Herman van Rompuy as the new Permanent President of the European Council, and Catherine Ashton, High Representative for Foreign and Security Policy. Both these new positions are constructed to guarantee better continuity and more coherent EU policies. Following the entry into force of the Treaty, a new Commission is also expected to be appointed by late January. As readers of this blog may be aware, the Baltic Sea Strategy is an issue on which I have been working intensively, and I am glad that we adopted a strategy for the region during the autumn. The idea is that the eight EU Member States in the Baltic Sea region should work more closely together for a cleaner sea and a more economically dynamic region. The Baltic Sea Strategy is a new way of working in the EU, where we try to look at the region from the perspective that many policy areas are connected, and I know that other regions within the EU are following the development with great interest. The Stockholm Programme is the new strategic work programme in the area of justice and home affairs. It will direct the EU’s judicial, police and migration cooperation for the coming five years. The ambition is to create a safer and more open Europe that safeguards the rights of the individual, where we strive to guarantee individual integrity and strengthen legal certainty while also stepping up cooperation in the fight against trafficking, smuggling and other forms of organized crime. The Stockholm Programme also carries the ambition to create a common asylum system, and I am pleased that the European Council was able to adopt it last week. We have made progress in the negotiations with both Croatia and Turkey, and applications from Iceland, Albania and Montenegro are now being reviewed by the Commission. We have also decided on visa liberalisation for Former Yugoslav Republic of Macedonia, Serbia and Montenegro. It is also positive that the work with the Eastern Partnership is going well. We have of course dealt with many other important issues, and to discuss each and every of them would make an long blog post even heavier to read. Let me just give a couple of examples: The deal recently closed on a European patent (a negotiation that has been going on for decades) and the Telecom package are both of great value for Europe. Personally, I also want to promote our efforts to connect equality and growth and how the insight about the interaction between the two can strengthen our common work in Europe.